Does free stuff and special events make up for not being able to play a game you bought? SOE is rather hoping it does. 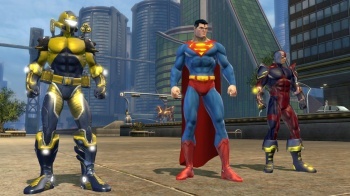 Sony Online Entertainment says that it has a number of special events planned to thank players of the PS3 versions of DC Universe Online and Free Realms for their patience while work continues on getting PSN back up and running. These events will commence on Saturday 30th April, although that is presumably reliant on PSN being back in action by then. SOE did not go into a whole lot of lot of detail about the events would be, except for a Double Station Cash day - Station Cash being the currency used across all SOE MMOs - for its entire portfolio. SOE also said that it was working on a separate plan to "make good" to the DCUO and Free Realms players affecting by the PSN problems. Again, what this actually means is unclear, but as DCUO has a subscription fee, some free play time would seem to be a fairly safe bet. Full details of these plans will be available on the game's respective websites soon. These outages will likely prove to be quite costly for SOE. Not just in terms of lost revenue - although that probably won't be an insignificant amount of money - but also in terms of consumer confidence. In fact, of the two, it's probably the latter that SOE will have to work hardest to recover.